supported by an essential Victor Tanker! QRA, day and night, 24hrs a day, 7 days a week, 52 weeks... 365 days, a year never a day off, always ready! Over and over again for so many years, Britain's Air Defences were regularly tested by Russian Tu-95 'Bears' as they probed NATO air space high above the North Sea! Here in typical Rondot style, Michael has reproduced this common, although equally, very tense event! 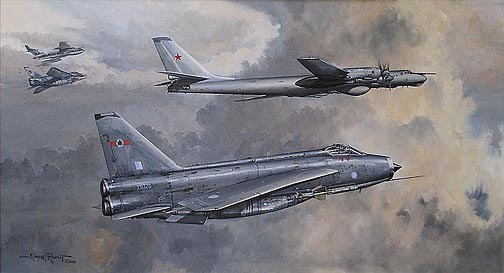 From an era of aviation that sadly no longer features the formidable Lightning, this striking image surely portrays the true aviation meaning of 'Cold War'! What a collection of names to go with these prints!! Signed by seasoned Lightning Pilots, Commanding Officers of various Lightning Squadron's, distinguished Falklands War Victor Pilots and a Fighter Controller from that golden age of mystique when Jet Noise 'really' was the sound of freedom!! !